Yesterday lunchtime in the RBA soprano Lauren Eberwein and the Rosebud String Quartet (Sheila Jaffé, Aaron Schwebel, Keith Hamm and Rachel Desoer) entertained us with a program of Haydn and Schoenberg. First up was an arrangement of Haydn’s Arianna a Naxos. We got the recitative, Teseo mio ben, and the two arias, Dove sei and Ah! che morir vorrei. It’s basically a cantata with tessitura that sits very nicely for Lauren’s voice. It was an elegant performance all round with some passion in the concluding aria. And it’s always good to hear a Haydn vocal work. March was a curiously quiet month. April starts to look busier, at least once we get past Easter. Tonight, Against the Grain have their monthly pub night at The Amsterdam Bicycle Club. Snow is forecast so you should all stay away and then maybe I’ll be able to get in. On Saturday at 4pm there’s a free (or PWYC) recital in Ernest Baumer Studio featuring soprano Stephanie Nakagawa and pianist Peemanat Kittimontreechai. 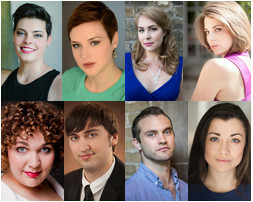 They will be performing arias from contemporary Canadian operas. On Thursday 13th Philippe Jaroussky and Les Violins du Roy will be appearing at Koerner Hall. It’s at 8pm and features mainly fairly obscure Handel material.